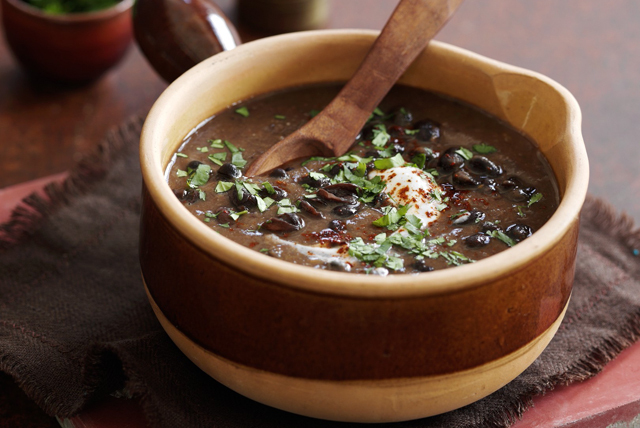 Simmer up a pot of our Mexican Black Bean Soup tonight. This hearty bean soup is loaded with bold flavour. What's even better is that it's oh so easy to make. Heat dressing in large saucepan on medium heat. Add onions and garlic; cook and stir 5 min. or until softened, adding chili powder and cumin for the last minute. Add broth, water, salsa and beans; stir. Bring to boil; simmer, partially covered, on medium-low heat 25 min., stirring occasionally. Ladle half the soup into blender container; blend until smooth. Return to remaining soup in saucepan; stir. Add Cheez Whiz; cook and stir 1 to 2 min. or Cheez Whiz is heated through and mixture is well blended. Remove from heat. Stir in cilantro. Serve topped with sour cream. Serve topped with chopped green onions, tomatoes and/or avocados in addition to the sour cream. This hearty soup can be prepared ahead of time. Cool, then refrigerate up to 2 days before reheating to serve. Or for longer storage, freeze soup in freezer-weight containers up to 2 months. Thaw in refrigerator before reheating.